•	The #MANarama campaign made history as the first time an English Football League rebranded mid-season and raised £150,000 for Prostate Cancer UK. •	In support of the campaign, Vanarama and sister brand Motorama donated £50 to the charity for every van, pickup truck and car it leased. This ‘lease a van, save a man’ initiative is running throughout September and October. •	Vanarama’s cheque for £150,000 was presented to Prostate Cancer UK at the flagship game for Non-League Day between FC Halifax and Chesterfield on October 13th. The presentation party included ultra-marathon hero Kevin Webber, who had just completed seven walking marathons in seven days. 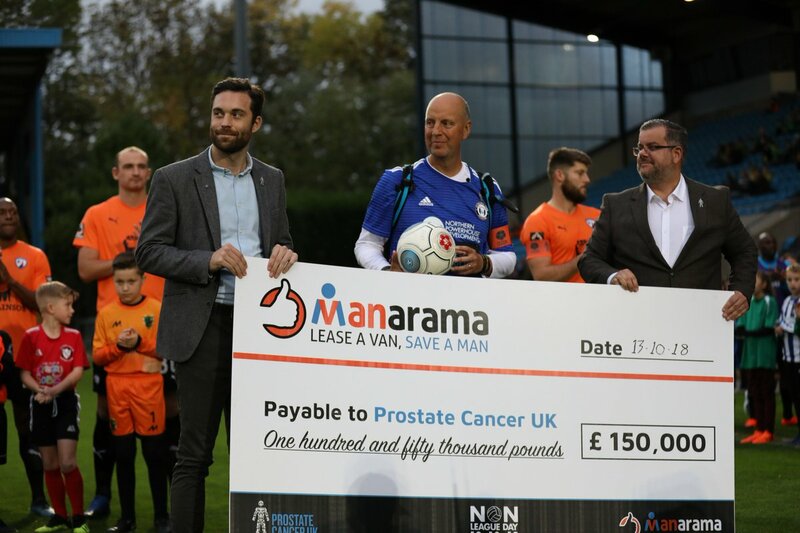 October 2018 - The ground-breaking #MANarama campaign, which saw the fifth and sixth tiers of English Football make football history through a mid-season re-brand, came to an end on Non-League Day and raised a total of £150,000 for Prostate Cancer UK. £150,000 was raised by Vanarama in just 43 days by donating £50 for every vehicle it leased from the start of September until Non-League day on October 13th. Within that time a staggering 688 men would have died from prostate cancer, highlighting just how important it is that more men are made aware of the most common cancer in men. Prostate Cancer UK became the National League’s first official sponsor for the 2018/19 season and this year’s Non-League Day was given added significance by the presence of Webber.